Don’t you just hate speed bumps? What if driving over them were not so annoying? Wouldn’t you just love that? So would we. That’s why we invented the Smart Bump, a speed bump that is so GENTLE to you, you will not even notice it’s there. All you have to do is to drive within the speed limit. However, the ones driving fast will experience the NASTY side of the speed bump. That is why we call it Smart, because it treats drivers differently depending on their speed. After all, the speed bumps exist to slow us down and to save lives. We just want a speed bump that performs its work without unnecessarily annoying us. 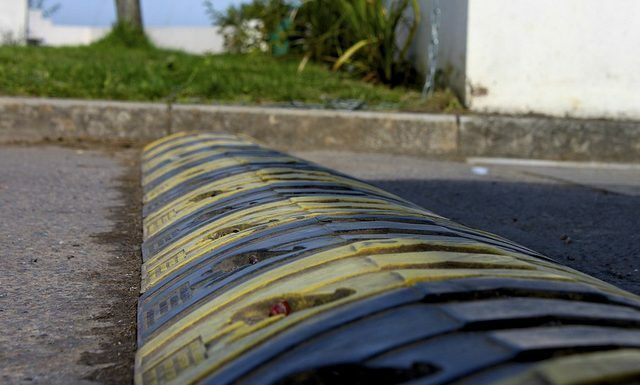 Currently we have successfully tested the prototype and plan to start producing and putting the Smart Bumps on the streets soon, so you can enjoy the benefits from them.